After spending seven days hiking the High Sierra alone, I made my way down to Mono Hot Springs, 7+ miles from Mile 878.7 on the PCT, to enjoy my first solo Zero Day on the trail. This stop was EXACTLY what I needed. Just when my spirits and overall mental state were feeling a bit down, I got some well-deserved R&R at Mono Hot Springs and was ready to hop back on the trail and start hiking the next day. Here are 10 reasons why I love Mono Hot Springs and yes, I’ll be back! From the moment I got here, I felt extremely welcomed by everyone on staff. Their sincere warmness went a long way with me, especially because I was visiting by myself and these were the first people I got to talk to since popping out of the High Sierra. From the super helpful lady at the front desk who answered all my questions and showed me where everything was to the guy managing the bathhouse who showed me how to run the mineral bath and chatted me up after my long soak to the wonderful masseuse and her healing touch and to the server and chef in the restaurant who bought me dinner. Thank you all for making my stay at Mono Hot Springs an amazing experience. This was my first shower in seven days and it was GLORIOUS! I was provided with a towel, body soap and even a facial cleanser for my shower. After my shower, I hopped into a warm mineral bath and soaked for an hour. This was the cleanest I’ve been on trail so far and probably the cleanest I’ll be until after I finish my thru-hike. It felt incredibly luxurious to be this clean. My accommodations at Mono Hot Springs were the priciest so far on trail. This stop was definitely a splurge and well worth it after spending a week alone in the High Sierra. For $140/night, I got a cute old rustic cabin all to myself. Cabin #8 came equipped with a queen size bed, a bunk bed and my own private bathroom with running water and a toilet, minus a bath or shower. It felt good to get out of my tent and sleeping bag, even for just one night. I had the whole cabin to myself. I was extremely sad when I saw the extra bed space in the cabin. My first thought was I wished I was sharing the cabin with my Team Lagger family. Eventually I took all of the contents out of my pack and used the extra space in the cabin to reorganize everything in my pack.,Later on after dinner, as soon as my head hit the pillow though, it was lights out. I slept like a rock. Following the advice of a local, I woke up at 5am and made the trek to the Old Pedro natural hot spring to watch the sunrise. It was hot and felt good on my tired hiker body. I got to meet and hang out with a few locals and guests of the resort while soaking. One of the locals even coordinated for me a ride back to VVR so I didn’t have to worry about trying to get a hitch up there. For dinner, I had the best Chicken Alfredo dish I’ve ever had in my life. It was a huge plate and I finished it all, along with two slices of garlic bread and a side salad. I polished everything down with a glass of delicious lemonade. I even had a slice of apple pie with a scoop of vanilla ice cream for dessert. On top of this being one of the best meals I’ve had on trail so far, the restaurant bought my dinner for me when they found out I was hiking the PCT on my own! I know this is the type of place people come to unplug. To be fair, I’d been unplugged over the last seven days in the High Sierra. I knew my mom was desperate to hear from me, wanting to know if I was okay. The WiFi at Mono Hot Springs is only available in front of the general store, not in the cabins or the bathhouse. I was able to get in touch with family and friends to let them know where I was at, get caught up on my emails and even had the chance to update my blog with a new post. I assure you, none of my online tasks had any effect on being able to take full advantage of all the services available at the resort. I even managed to squeeze in an hour-long massage before dinner. As a thru-hiker, laundry services are an amenity MUST when choosing where to stay at a town stop. Who wants to put on stinky, dirty clothes that have been hiked in for days on end after having a warm shower? Most places will offer laundry facilities, like having a washer and dryer on site. Sometimes it’s free and sometimes there’s an extra charge. Places like the Warner Springs Community Center offer bucket laundry. Some hotels will offer laundry services where they wash your laundry for you. Other towns have laundromats to do laundry in. At Mono Hot Springs, I paid $3 to do a full load of laundry that included detergent and clean loaner clothes to wear while all my clothes were getting cleaned. I was super happy with that. Normally town days can be quite stressful. If the town isn’t directly on trail, you have to get a ride there, which most of the time means having to hitchhike. Once you’re in town, there’s chores you have to do – shower, laundry, resupply food for the next section, repair/clean gear, contact loved ones, plan ahead for the next town stop, eat and pick up a resupply box if you had one sent there. At Mono Hot Springs, I was able to get all my chores done and more without ever having to stress or worry. Once I was at the resort, everything I needed was within a two to five minute walk from each other. I picked up my resupply box when I checked in for my cabin. I was able to do my laundry while showering and soaking in the bathhouse. I added a couple of things to my resupply for the next section at the resort’s general store. I even got postcards to send to family and friends and mailed them off before I left the resort. I had plenty of time and room in my cabin to air out my sleeping bag and clean everything in my pack, including my JetBoil stove. Once my “town” chores were done, I had more than enough time to enjoy a massage, my dinner and a sunrise soak in the natural hot spring. Don’t get me wrong, I love my fellow thru-hikers. It’s nice to be able to meet someone and instantly connect with them over shared experiences on the trail. It’s also quite a luxury to be able to be a thru-hiker and escape the thru-hiking experience for 24 hours. While at Mono Hot Springs, I met a number of the employees, locals and even some of the guests of the resort. One old couple staying at the resort saw my pack and asked about it. When I told them it had taken me 62 days to hike from Campo to Mono Hot Springs along the PCT, the husband brought out his camera and took a picture of me. Other guests started asking about the PCT and my experiences along the trail. It felt good to share some of my experiences with them and answer their questions about the trail. It was quite a different pace from being asked about my start date and how many miles I’m doing each day – two questions most hikers love to ask other hikers. Most PCT hikers take the ferry from the PCT cross Lake Edison into Vermillion Valley Resort and spend their Nero or Zero Day there. In talking with other hikers, I found a lot of hikers didn’t know about Mono Hot Springs. I only knew about the resort and put it on my town stop list because a friend of mine had told me to stop there. Once you get to VVR, either by ferry or by hiking down one of the trails along the lake, Mono Hot Springs is a five mile drive down a small, two lane road. For me, it was a super easy hitch to and from Mono Hot Springs. Leaving VVR, I hadn’t been walking on the road for a minute when a truck with a couple of cowboys pulling a trailer full of stock stopped and asked if I needed a ride. Coming back to VVR, one of the locals was heading up to VVR and asked if I wanted a ride so I wouldn’t have to worry about hitching back up the road. Coming and going, I didn’t have to stick my thumb out or ask for a ride. Two of the easiest solo hitches I’ve had on trail! If you’re a PCT thru-hiker and looking for a little bit of relaxation along your journey, make the extra effort to get down to Mono Hot Springs. You won’t regret it. It will probably be one of your most favorite Zero Days on trail. 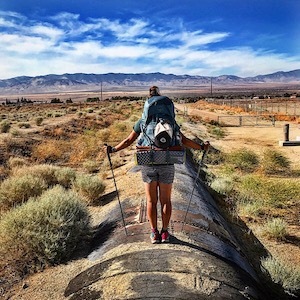 Want to be an active part of my PCT thru-hike without taking a single step? Click Here for more details.